I found out recently that there is now a second version of the Turbo Chameleon 64 cartridge for the Commodore 64. The reason for this is, apparently, that the Cyclone III FPGA that was used in the original design has been superceded and is difficult to obtain at affordable prices. For this reason Individual Computers have redesigned the cartridge to use a Cyclone 10 FPGA instead. The model chosen is essentially the same thing in a different package, so porting cores would simply be a case of recompiling with the new device and pinout as the target – except they’ve also taken the opportunity to make small improvements to the design. For this reason it now takes a little bit of work to port existing cores to the V2 hardware. I now have an initial build of the Minimig core for V2 hardware, which is available as before on the Minimig TC64 Snapshots page. The fampiga_tc64v2.rbf file is the core itself, and needs to be flashed into the Chameleon cartridge using the Chaco utility. Another point to bear in mind is that the core doesn’t yet attempt to translate the C64 keyboard to the Amiga – so far just the run/stop key is used to toggle the OSD – so you will need a PS/2 keyboard to use the core for anything that requires keyboard input. Source is availabe, as before, on github. Megadrive core: as good as it gets? While it’s still not perfect, the glitches should be much less noticeable, and hopefully there will no more missing platforms or missiles making games unplayable! In the first part of this series I covered some basic tidy-ups to the code to make it easier to maintain. Now I’ll look at how we can speed things up. The Megadrive/Genesis core has been plagued from the start with graphical issues that result from the SDRAM controller not responding quickly enough. Over the last few days I’ve finally put some time into understanding the SDRAM controller used by the project and spent some time improving its throughput. I’ve just made available an updated version of the Sega Megadrive / Genesis core for the Turbo Chameleon 64. The only change is to the joystick handling – I’ve untangled the joystick directions and remapped the buttons slightly. I’ve mapped Volume UP to button A simply because it physically feels in the right place. The CDTV pad isn’t super-responsive, so trying to use for serious gameplay is an exercise in frustration, but it does work, and the controllers are readily available from AmigaKit. One of the challenges I’ve faced in the ZPUDemos project is keeping the various targets up to date. When I add a peripheral to – for example – the SDBootstrap SOC, I have to modify each and every target’s project file to match, and it’s very easy to lose track of which ones have been updated and which ones haven’t. ZPUDemos currently supports no fewer than eight different target boards, and contains eleven different projects – that’s a lot of project files! Part 7 – Loading data from SD card. In this part of the series I’m going to look at the most useful aspect of the control module – using it load data from SD card and pass it to the host core. To make a meaningful demonstration, the host core needed to be able to do something with the received data, so I’ve pulled in the SDRAM controller and VGA framebuffer from the ZPUDemos project. 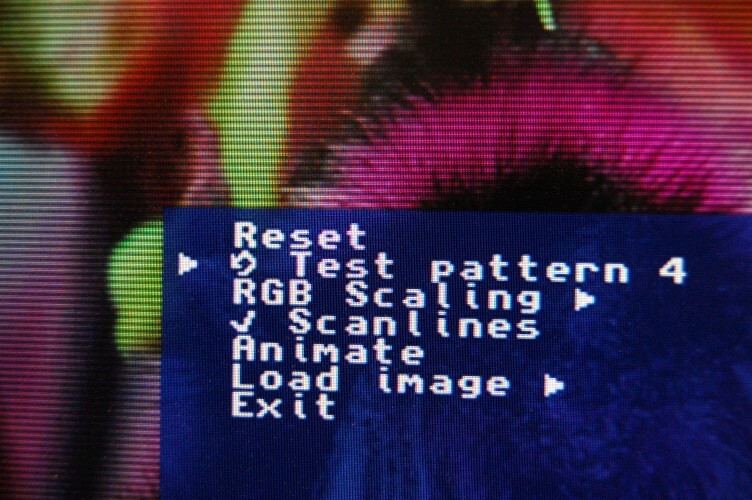 What I’ve called the “host core”, the part of the project which the ZPU-based control module is supporting, is now capable of displaying a 640x480x16-bit VGA screen from SDRAM, and as such the project is now quite a bit more complicated; however, the only new file needed by the control module itself is spi.vhd which handles communication with the SD card. So far we have the control module merging an on-screen display with the underlying host core’s video output, responding to keypresses and running a simple on-screen menu. The largest single addition now will be SD card access, which I will explore in the next part. In this part, however, I’m going to talk about resource sharing.